The CONNECT product line guarantees a tested and secure connection to own and third-party systems. Continuous safety extends far beyond the last prefabricated concrete element! The transitions, tested in accordance with ENV 1317-4 in combination with a range of Transition elements ensure the reliable restraint function. Suitable elements are also available for connection to existing systems and for Special applications. Thanks to a wide variety of tested transitions and transition elements, REBLOC® is able to ensure secure transitions to other systems such as steel guardrail and in-situ concrete safety barriers. 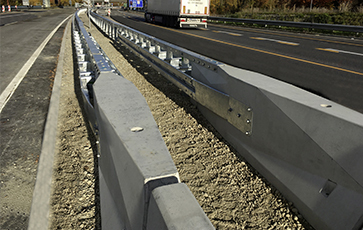 In addition, combinations of different prefabricated concrete barrier parts are also possible. REBLOC® is the ideal partner for solutions from a single source for a wide variety of special applications. Users can select precisely the right product from an expansive pool for maximum passive road safety on motorways.